Autumn. Season of mists and mellow fruitfulness. Two old friends – Daniel, a centenarian, and Elisabeth, an art historian born in 1984 – look to both the future and the past as the United Kingdom stands divided by a historic, once-in-a-generation summer. Love is won, love is lost. Hope is hand-in-hand with hopelessness. The seasons roll round, as ever. A luminous meditation on the meaning of richness and harvest and worth, Autumn is the first installment of Smith’s Seasonal Quartet, and it casts an eye over our own time: Who are we? What are we made of? Shakespearean jeu d’esprit, Keatsian melancholy, the sheer bright energy of 1960s Pop Art. 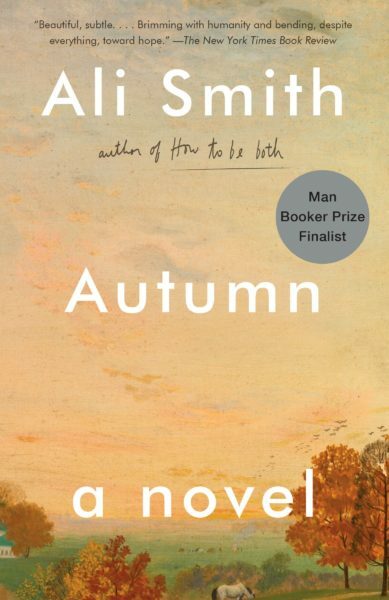 Wide-ranging in time-scale and light-footed through histories, Autumn is an unforgettable story about aging, time, love; and stories themselves; a Man Booker Prize finalist, and one of the best books of the year according to the New York Times, NPR, The Guardian, Slate, the Chicago Tribune, and more! Moderated by Kristina Aaronson.